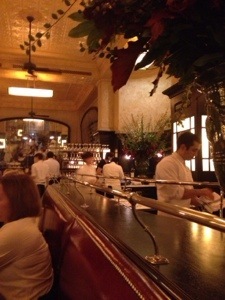 I didn’t plan to spend my evening at Balthazar. I went with a friend to the Lyceum theatre to try and wangle cheap tickets to see the Lion King on the premise that they would be keen to sell them with less than hour before it started. After all, what’s the point in singing Hakuna Matata to a half empty theatre. The box office didn’t seem to share our view and wouldn’t budge lower than £65 so we went on our way. Where to go for dinner, we wondered. Then all of a sudden we saw the red sign outside Balthazar. I’d heard you have to book weeks in advance for Balthazar so wasn’t expecting a positive outcome, yet we marched in on the off chance asking for a table for two, and much to our surprise we were seated within seconds. It was only 6.30pm though, hardly prime dining time. Nonetheless it was busy even then and the French bistro vibe was very apparent. Our table was extremely close to our neighbours who were having an interesting discussion. One was an advocate of marrying young, the other very against it, defending his position with the saying “you shouldn’t bring a sandwich to a restaurant.” Make of that what you will. Once we could tear ourselves away from their debate, we chatted to the very friendly waiter about the menu. He recommended the steak tartare to start and grilled dorade for main. I went with his recommendations; we shared the steak tartare and my friend ordered cod for main. To drink I opted for a whiskey sour which was excellent. 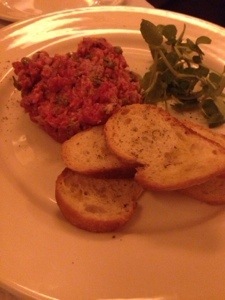 I wasn’t wowed by the steak tartare. It was by no means bad but it didn’t excite me in the slightest. I was more taken with the bread basket! There were two varieties of wonderful rustic brown bread. 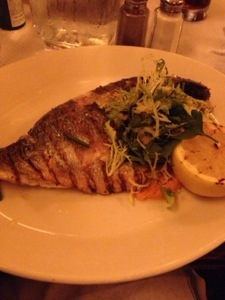 The dorade was boney despite being described as served filleted. It came with some leaves. Again I’m afraid to say I wasn’t overly impressed. The same could be said of the cod, according to my friend. The table one away from us, although it’s so cosy they were almost next to us, were generously dressing profiteroles in chocolate sauce whilst we were on mains. Having witnessed that, it was difficult to decline ordering our own. We ordered one to share and this was by far the best part of the meal. 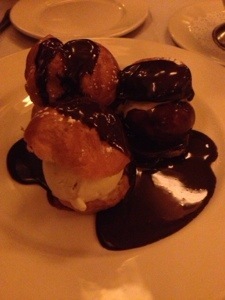 The sauce was intense yet not too rich and the profiteroles were made with ice cream instead of cream which went wonderfully with the sauce.